Sonic Cathedral was lucky enough to catch up with Sharon den Adel in person, backstage before the band’s sold out concert in San Francisco (the first stop of their 2014 U.S. tour). Sharon took a break from signing 6,000 posters for fans (!) to tell us about reactions to Hydra, including the controversial “And We Run”; what the band learned from adapting Lana Del Rey’s “Summertime Sadness”; how the upcoming Hydra DVD became an Elements DVD (a scoop we promised not to share until the band announced it); the inspiration for “Dangerous” and “Covered by Roses”; her favorite Game of Thrones character; and why WT’s tour doesn’t include as many states as she’d like. Read on! It is a fine thing that Los Angeles vocalist, VK Lynn, turned to a life of music, instead of a life of crime. With her vivid pink hair and bright blue eyes, she wouldn’t exactly be hard to pick out in a line-up. 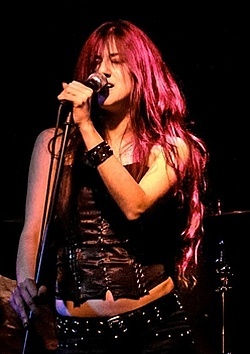 Likewise, her blues-inflected voice makes her stand out from the more typical vocal style found in metal and rock. This busy lady has teamed up with a couple of Finns -- Janne Tamminen (guitars and keys) and Arno Nurmisto (bass) -- and fellow Yank, Justin Lee Dixon (drums), to form a brand new band that goes by the rather lengthy name of From Light Rose the Angels. If moonshine could transmogrify, it undoubtedly would take the form of Devilskin’s album, We Rise. One minute, the New Zealanders’ debut offering makes your eyes water and your throat burn in a wash of barely distilled rage. The next minute, it slides down smoothly and warms your belly with luminous melody. After three or four spins, your brain will urge you to put We Rise away, and quit neglecting the other albums gathering dust on your shelf. But you won’t; you CAN’T. You have become hopelessly addicted. The Los Angeles-based hard rock/metal band, Edge of Paradise, might have come together through a series of happy accidents, but the mark they are making on the music scene is anything but an accident. Hard work and a single-minded focus on developing their sound, honing their stage presence, and winning over fans is more like it. Fans who already love Edge of Paradise’s debut album, Mask, will be in for a bit of a surprise with Immortal Waltz, which redefines the band’s sound. With Michael Wagener (Metallica, Dokken, Ozzy, etc.) in the producer’s chair, Immortal Waltz is sure to please.